FMO’s sustainable investments in businesses and projects in emerging and frontier markets in aggregate touch on virtually all Sustainable Development Goals (SDGs). Some more directly then others, but ultimately everything FMO does has some effect on the targets set out by the SDGs. FMO’s annual reporting focusses on 3 SDGs where it believes it can have the most direct impact namely SDG 8, 10 and 13. When it comes to reporting for various fund portfolios we have chosen to show those SDGs where a direct positive link can be assumed to exist between an investment and specific targets and/or indicators set out in the SDGs. The graphs are built based on the investment amounts at the time of the investment by the fund and shown as a percentage of the portfolio. All investments are screened and labelled based on below overview. As the fund itself is a partnership contributing to the SDGs, SDG 17 Partnerships for the goals always applies. • How FMO measures its impact. The United Nations Sustainable Development Goals (SDGs) and the Paris Climate Agreement have set joint public and corporate agendas aimed at ending extreme poverty, reducing inequality and tackling climate change. They recognize that people living in poverty tend to suffer most from climate change, so these challenges will need to be addressed in tandem. Development banks can make significant contributions to the SDGs and have a role in limiting temperature increases below 1.5 - 2.0 degrees Celsius. By design, FMO addresses global issues every day. Public and private stakeholders share FMOs commitment to the SDGs and the Paris Climate Accord. They challenge FMO on how a development bank can set ambitious targets to address global issues and be transparent about outcomes achieved. FMO has set targets to generate impact and with the help of its partners and expert recommendations, such as those from the Task Force on Climate-related Financial Disclosures and the EU High-level Group on Sustainable Finance, FMO refines ways to share progress. FMO updated its strategy in 2017 for the period up to 2025, in which FMO partners with others to invest in local prosperity focusing on projects that contribute to SDG 8 (Decent Work and Economic Growth), SDG 10 (Reduced Inequalities) and SDG 13 (Climate Action). 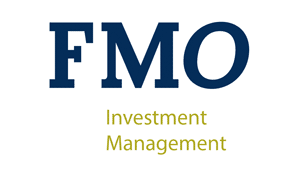 FMO Investment Management BV is a subsidiary of FMO NV.